A team of scientists has developed a new technology that can make the skin on your arms and hands act like a touchpad for smartwatch. The technology, known as SkinTrack, developed by the Futures Interface Group, a research lab at Carnegie Mellon University. 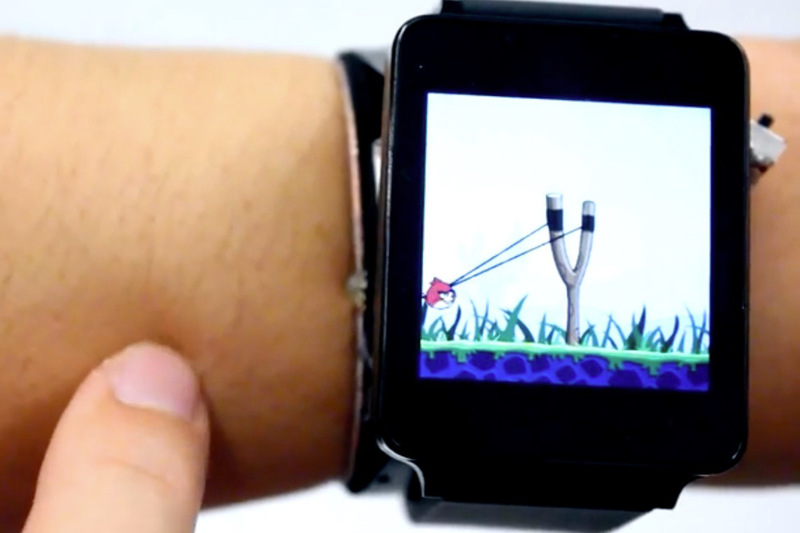 This technology requires the user to wear rings and sensors attached to a rope smartwatch. The sensor has four electrodes, which used to receive high frequency electrical signals emitted by the ring when a finger touches the skin, to calculate the exact position of the finger. This technology also enables the user to swipe and press the arms to interact with smartwatch, and even allows users to paint a picture in the arm. This technology also transcends the limitations of a small smartphone screen to allow users to drag the app out smartwatch and place them on the whole arm. Skintrack also can understand the hot key commands, thus enabling its users to mute incoming calls by simply writing 'S' on the arm or trace an "N" on your hand to open up your news app. SkinTrack can even track your finger when it’s hovering above the skin.